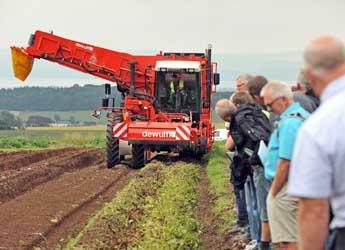 Potatoes in Practice is the largest field-based potato event in the UK. The event brings together variety trials, research and trade exhibits in one place making it an essential date in the potato industry calendar. The event is organised by the James Hutton Institute, Potato Council, SRUC (Scotland's Rural College) and Agrii. The event is supported by media partner Potato Review. The winners of this year's whisky prize draw are Martin McCulloch, Teagasc for pre-registered attendees, and Jim Stewart, QV Foods for completed feedback forms. network with colleagues, suppliers and industry experts. Were you at Potatoes in Practice 2013? Let us know what you thought of the event by filling in our short online survey. It only takes a few minutes and will enable us to improve the event in future. New for 2014, Harvesting Clinics will enable attendees to discuss issues and solutions with leading industry experts and manufacturers. 10am, 11am and 1.30pm: Guided tours. Attendees are free to visit field plots for further discussion at any time outwith these tours. The full programme and exhibitor guide will be available here in July 2014. Attendees will receive a printed copy on the day. Seminar speakers and topics for 2014 are as follows. 11.10am and 3pm: The grain aphid: could it become a threat to your seed potato crop? All seminars take place in the seminar marquee. 2013 seminars covered the impact of haulm destruction on the development of blackleg in seed crops, improving cultivation practices in potatoes and protecting GB’s national seed crop. Exhibitor booking for Potatoes in Practice 2014 is now closed. If you have any queries about booking please contact events@hutton.ac.uk. If you have any queries or wish further information, please contact: Sharon Neilson, Events Co-ordinator, Potatoes in Practice, The James Hutton Institute, Invergowrie, Dundee DD2 5DA. Email: events@hutton.ac.uk, Tel: +44 (0)344 928 5428.